Product information "SRAM Groupset GX1 - 1000 GXP 1x11-speed, black"
RIDE YOUR WAY. For every bike, there's a rider. A rider who builds it. A rider who knows it. A rider who's always ready to take the bike somewhere new. Introducing GX, the drivetrain for people who love to ride without restraint. From beginner to expert, GX delivers personalized gear choices that take you as far and wide as you want to go. Engineered in Germany with 1x and 2x options, SRAM GX brings the power of riding to everyone, everywhere. The SRAM GX crankset delivers consistent performance every time out. Featuring SRAM's X-SYNC™ tooth profile, the GX crankset is engineered for complete chain control. Each tooth's thickness is CNC machined to work seamlessly with the chain's inner and outer links. And with five available chainrings (30-32-34-36-38), you can personalize your gear range to match the way you ride. The SRAM GX X-HORIZON™ rear derailleur is engineered for smooth, reliable shifting action—from the larger upper pulley offset to the 12-tooth X-SYNC™ pulley wheels. By eliminating unwanted chain movement, X-HORIZON™ shifts faster, puts an end to ghost shifting and reduces shift force and chain slap. And with CAGE LOCK™ technology, wheel removal and installation are easier than ever. Designed for the most discerning, performance obsessed riders, new GX 11-speed Grip Shift features lightweight construction and delivers outstanding speed and precision. FULL PIN™ technology uses eleven lightweight, stamped steel cogs held together with 123 high-strength stainless steel pins. The result: a cassette that's light, durable and equipped with SRAM's super wide 10-42 gear range that's a perfect fit for any ride. The open design similar to our X-DOME™ cassette aids in mud clearance, giving you cleaner shifting performance and longer component life. 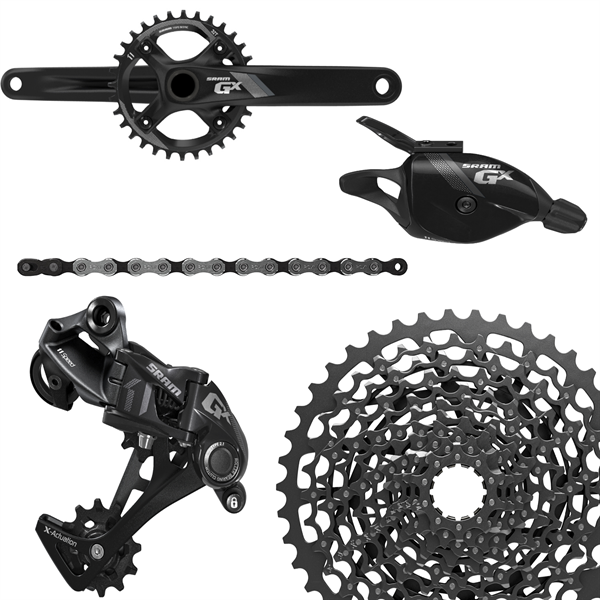 Related links to "SRAM Groupset GX1 - 1000 GXP 1x11-speed, black"
Customer evaluation for "SRAM Groupset GX1 - 1000 GXP 1x11-speed, black"